in Mobile Marketing, Search Marketing with tags App Indexing API, Deep linking, google maps, google+, Mobile, Search Engines, search results Both comments and trackbacks are closed. Search has reached a mobile tipping point with more than 50 percent of all queries coming from mobile devices. To make the most of search efforts on mobile, marketers should be aware of the fact that search engines are no longer just driving to website content, but to native app content as well. In April, Google announced an update about its App Indexing API, which helps the search engine crawl and display in-app content in search results pages on mobile devices, similarly to how Google crawls and indexes the web for desktop searches. Google’s App Indexing API presents marketers with new opportunities to make brand content discoverable in mobile searches. To take advantage, marketers need to assist Google in crawling and indexing brand content in their apps, as well as to properly annotate their sites for Google’s search engine to understand whether content lives in the native app or on the website. In the below post we dive into how Google’s App Indexing API works and how marketers can ensure their content is being surfaced and optimized. 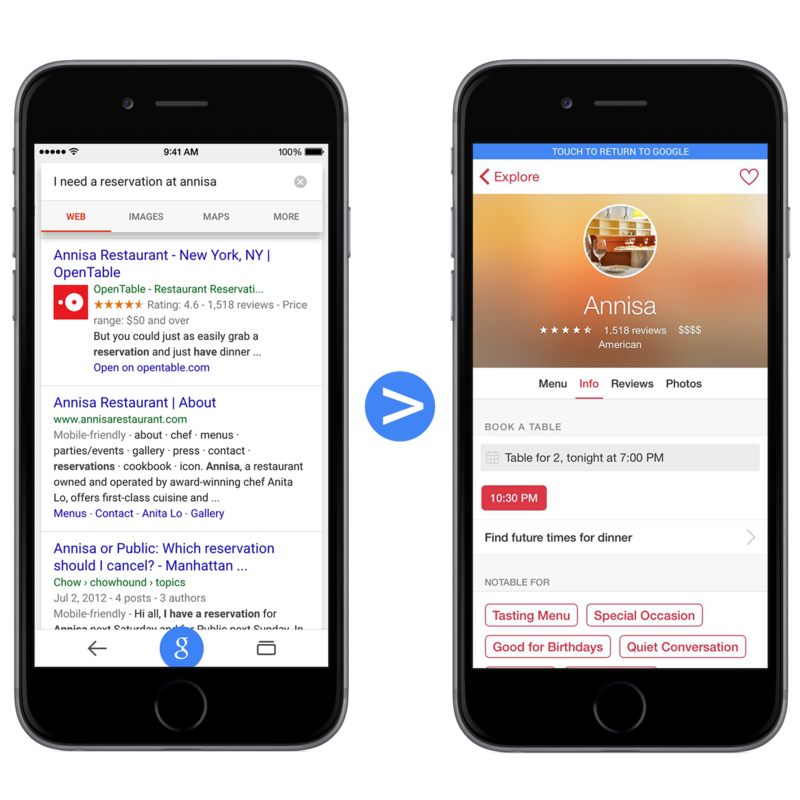 Beyond just seeing the option to click directly to a brand’s mobile site, users will now see app results via search engines. If users haven’t yet installed an app, the App Indexing API will connect the dots and place an “install” button option in the search results. While the API currently only works for Android devices, Google announced in May that it will begin surfacing iOS app content in the near future. The technology will allow for Android and iOS users utilizing the Google app to bypass google.com completely, and go directly to results within various apps themselves. To take advantage of this new functionality, a brand’s developers will need to enable deep linking functions within their apps. From a user experience within the context of apps, deep linking informs an app to launch and open specific content or functions in another app. For example, when using Google Now to determine a travel route or get updates on traffic, clicking on the “navigate” icon in Google Now deep links to the Google Maps app. Google Maps then provides specific coordinates and offers alternate routes to beat the traffic. App developers will need to set up the brand’s app for App Indexing by following Google’s guidelines. Web developers will need to set up a brand’s website with the proper annotations for Android deep links. This creates a correlation between specific content and where it can be accessed from the app or the web browser. From the Google Play console to the Google Search console (formerly known as Webmaster Tools), marketers should connect a brand’s app to the brand’s website. Developers can further tell Google about the types of actions users take in their app, allowing the Google Search app to surface these to users when they are actively searching outside of the app by enabling Query Autocomplete. Brands that already invest in their mobile App experience would be wise to work with Google’s App Indexing API to ensure search efforts are being optimized across both website and app. For marketers considering where to best direct their energy (app or website? ), it is important to remember that the website is the default option selected by users to connect to a brand. While App Indexing provides additional opportunities for brands to reach consumers as they search, marketers should ensure they are investing in creating the best mobile web page experiences first and foremost. Greg Garritani, SEO Analyst at 360i, contributed to this post.